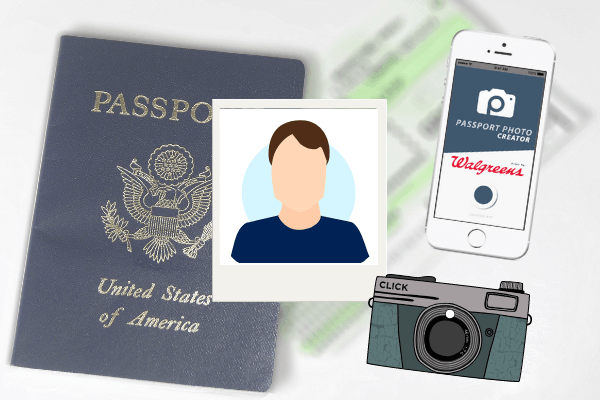 You can take passport photos yourself with a smartphone and the right app. You’ll need to make sure you have white background and it’s usually best to have another person take the photo for you. We recommend the Passport Photo Creator app. It’s free and easy to use. The app uses biometric facial recognition software and knows all the complex requirements set by the U.S. Department of State Passport Agency. The benefit is that you can take as many photos as you want until you are satisfied with the way you look. Once you like your passport photo and it meets the requirements, you can choose to print at any Walgreens location near you. There is no additional fee to use this app so you only pay the normal passport photo price when you pick it up at Walgreens. Pros: You can do as many re-takes as you like. This is an especially good option for infants and children because you can take as many pictures as you want for free, instead of crossing your fingers, hoping and praying that your little darling doesn’t decide to yawn, cry, or start sucking his thumb in the middle of a drugstore photo shoot. Cons: Even if you read the US Passport Agency’s guidelines for passport photos carefully, there is no guarantee any photo will be accepted. It’s ultimately up to the agent that is processing your application. However, this app will give you the best chance of a successful and perfect passport photo. Walgreen’s, CVS, Rite-Aid and most other drug store chains offer passport photo services. The cost is usually around $15 for two photos. There is no guarantee your photo will meet the compliance guidelines and you may not like the way your photo looks. Still, most people use this option. The Pro’s: Ideally, the photographer has been trained and is aware of all the special requirements for passport photos. Plus, drug stores provide instant gratification, since your photos are ready in just a few minutes. The Cons: This option is more expensive than doing it yourself, retakes cost extra and the quality of the pictures can vary. Babies and toddlers can require multiple retakes to get pictures that comply with US Passport Agency regulations, and the charges can add up. Many post offices across the country are also US Passport Acceptance facilities and some of them offer passport photo services. Pros: Post office employees should be familiar with acceptance requirements for passport photos. Also, you can get your photo taken and turn in your application at the same time, so you’ll save a trip. Cons: You may be required to make an appointment and they may not have passport photo options available. Some professional photography studios offer passport photo services. Pros: You’ll probably get better, more attractive passport photos, since the person on the other end of the camera is a professional, full-time photographer. For infants and small children, professional photographers might get better results because they have extensive practice coaxing good pictures out of little kids. Some photographers offer “Executive passport photo services,” which means they’ll come to you for a hefty fee. Cons: Fees vary by studio, but expect it to cost a good deal more than the post office. Once you have your passport photos, it’s time to apply for a new passport. RushMyPassport.com can help you get your passport quickly and easily, with processing times as low as 24 hours! If you need a passport in a hurry, come see why we are one of the top companies in the expediting industry, and expedite your passport with us today!